Here at The Digi Dame Party Shoppe, we're a little bunch of Potterheads, which means that we love a good Potter party! Recently we styled and hosted a fun Hogwarts-themed party for one of our young Potter fans (turning our loungeroom into a mini-Hogwarts). So, we thought we'd share some of the details with you for some potter-party inspiration. So let's take a look at how you can combine our ideas here with your own creativity to create your own magical wizard party! I made the cake from scratch. I chose to make a caramel cake, to closely resemble a "butterbeer" flavour. It was assembled in a checkerboard pattern in mustard yellow and burgundy; the Gryffindor colours. Unfortunately, stupid me forgot to take a photograph once the cake was cut - so I'm so sorry, but I've got no photos! To create the checkerboard pattern, I followed an online tutorial which I found at My Cake School. It was a bit of work, but totally worth it. The results were great. After assembling and stacking the cake, it was covered in buttercream before decorating with fondant. I was very rushed on the day of decorating, so the whole thing ended up looking a bit wonky, but nobody seemed to mind. The Golden Snitch was one of the birthday boy's gifts, which made a very quick and easy cake topper! If you know me, you'll know that I love DIY, but I also love quick and easy! The paper Hogwarts banner was a free printable that I downloaded from Bakingdom. If you love to bake, be sure to check out Darla's blog; she shares some great ideas! For the main Great Hall backdrop, we used plastic table covers, in the four Hogwarts house colours and in the stone wall pattern. These were sourced from party suppliers online. Each tablecloth cost only a few dollars, so they provided us with great impact for minimal cost. They're also a cheaper option that traditional backdrops. So if you're decorating a small area, table covers may be the way to go. To create the Great Hall curtain effect, we simply hung each house "banner" using the tablecloths, then tied them with string to gather in the centre, creating a curtain effect. Each house emblem was printed onto matching coloured paper and stuck at the top of each banner. I also added two Hogwarts shields for an extra pop of colour. The emblems in PNG format were sourced from kisspng by searching for "Harry Potter". The quote sign was a free printable we found at The Cottage Market. The Head table is covered in a plain black tablecloth to provide some colour contrast and provide a great backdrop to the decorations. The bunting and educational decree in the image above are both party of our Wizard Magic School Party Decorations Pack. The S.P.E.W. and Weasleys Wizard Wheezes posters and were free downloads from Muggle Magic printed onto brightly coloured paper. We wanted to make sure that we incorporated Platform 9 3/4 into our party decor, so we created this little scene in one corner of the room, just to one side of the Great Hall Head table. For the brick wall, white cotton fabric that we already had did the trick. I made this by mixing some red acrylic paint with a little black paint to get the colour that we wanted and applied it using a household sponge. You can find a tutorial for the wall at Paper Trail Design if you would also like to tackle it yourself. There are red brick backdrops available for purchase that will serve you well if you don't wish to make your own wall. I found them to be overpriced, however, and because we already had the required materials, DIY seemed the best option. This may not be best for you though, if you have to purchase the materials anyway. We already owned Hedwig, and the birdcage I found! It was being thrown away in a council rubbish pick up, so it was a case of lucky finders keepers! It was originally white, but a quick spray of black paint (that we already had) and it made a great home for Hedwig on the platform. The wanted posters were sourced from Poster Girl. The Harry, Ron and Hermione plush toys we already had, but they were originally purchased from Big W.
We also had the Firebolt broomstick, but these can be purchased from Spotlight. The editable certificate comes from our Wizard Magic School Party Decorations Pack. The gorgeous postal boxes were easily made by wrapping plain boxes in brown paper and tying with string. I made the stickers by printing emblems and logos onto sticker paper and cutting them out. Sourced from Pinterest, the owl post envelopes were printed, assembled and then sealed with our DIY wax seals, using a red crayon and a button. I followed the tutorial at My Poppet. On the other side of the Great Hall, we included some of Hogwarts' portraits and the proclamations that Professor Umbridge introduced during her term there. Even a party's gotta have some rules, right? The educational decrees were sourced from Paper Trail Design. We sourced the portraits from Pinterest and added picture frames from kisspng before printing them, and the Wizard photo prop was made from scratch by yours truly. The invisibility cloak sign was from our own Wizard Magic School Party Decorations Pack and we hung the coathanger beneath it for a giggle. Well, I thought it was funny, anyway. We found the Gringotts bank notes at A Crafty Chick. The gold coins were purchased from the local supermarket. I bought a heap of them, so we're still eating them. Our potions bottles were collected for weeks before the party. Any bottles and jars that we emptied were used! For some of them I replaced the caps and lids with circles of tea-stained cloth, frayed a little and tied with string. I filled the bottles with various household items - grass, leaves, chia seeds, stones, baking soda, custard powder, raisins, syrup, and coloured water. Salve squeezed from a tube made the most authentic-looking bubotuber pus! The dragon eggs were created with plastic Easter eggs. I used hot glue to draw on textured patterns. Then I painted the eggs and finished with glitter dust. The kids absolutely loved these! Weasley's got himself a Howler! I made Mrs Weasley's Howler based on this tutorial from Snapguide. I had to simplify it somewhat, because I'm a total dummy and struggled to get the folding right! Aren't these printables great? We had so much fun putting them together, and our birthday boy just loves them. The Ministry of Magic Identity Card and Knight Bus ticket printables came from FanGirlTastic. The printable spell sheets are from Party Pieces. The Hogwarts Student ID card, maps and the Dumbledore's Army page were found at Muggle Magic. More jars were collected to store our party sweets, labelled with the Honeydukes logo. The Honeydukes sign came from greendude34 at Deviantart. We created golden snitches from Fererro Rocher chocolates, using the wings from Party Delights. The peppermint toads box was found on Pinterest and the Weasleys Wizard Wheezes box from Juliette. Our chocolate frog boxes and cards were downloaded from Muggle Magic. These cute little popcorn boxes were made by us. 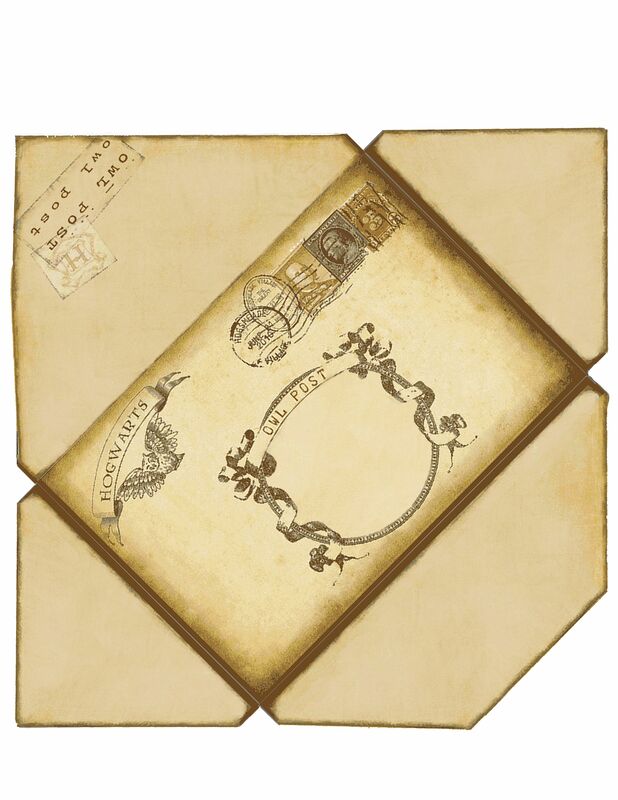 I also made a personalised Hogwarts envelope containing the birthday boy's own letter to attend the school of witchcraft and wizardry. He was so excited! As party of our Luna Lovegood costume, we created these cute little Quibbler magazines by printing the cover designs from various sources and filling them with catalogue pages. These were one of my favourite party props. Beyond the main party area, we also added some fun features to the bathroom and toilet, as these photographs show. The writing above was applied by lipstick - the quickest and easiest method was preferred to paint. It was also much easier to clean up. We flush ourselves down. It's bloody disgusting. I created these decorations by printing them onto transparent sticker paper. Moaning Myrtle insisted that we were welcome to share her toilet if we died in the Chamber of Secrets. For our first activity, we had everyone sorted into their Hogwarts houses using our boy's sorting hat toy. Next, we conducted a Golden Snitch hunt, with delicious Ferrero Rochers hidden around the room. Our third game was Harry Potter Charades, where we had to "act out" characters and objects. Lastly, we split into two teams for a game of Quidditch Pong - The Potters and The Weasleys. Players had to pick their team by pulling a piece of paper from a cup (pieces of parchment containing the team names had been burned on the edges like they had been pulled out of the TriWizard Cup). Each team had a team captain who was also the team's seeker. The rules are shown in the image above. With 3 homemade rings and cups set up (similar to quidditch beer pong) we did not use drinks, but simply aimed ping pong balls through the hoops and into the cups. Each player got 3 throws per turn, and each ball that landed in a cup scored ten points. The first team to score 150 points won the game. I also painted one ball gold. This was the golden snitch. Only the seekers could throw the snitch on their turn, as one of their 3 throws. If they got the snitch into a cup, they scored 150 points and automatically won the game for their team. I kept score using the image shown above. I printed it off and placed it inside a picture frame, so I could write scores on the glass with a whiteboard marker and easily wipe it off after each round. We played a couple of rounds and the winners won some fun prizes! We hope that these photographs and free resources have provided you with some ideas and inspiration for your own potter party! If you need some magical party invitations to get your own party started, we've got you covered. Click on the images to visit our listings.